What we think about the budget? As expected, the growing discontent among low and middle-income voters and small businesses nudged the government to push for its re-election agenda harder today. The budget for the full year (financial year starting 1 April 2019) unveiled by interim finance minister Piyush Goyal was high on social spending and tax cuts but low on revenue-boosting measures, while the long-term goal of cutting down the fiscal deficit to a comfortable 3% level will likely remain on paper. Despite being an interim budget, the vote-on-account, as the convention for a government heading into an election goes, it didn’t fall short of big-bang (vote-seeking) spending measures, especially for farmers and low-income voters. Meanwhile, a surge in government spending in the current financial year caused yet another breach in the fiscal deficit, above the original target set for the year. This is despite the projection of strong revenue growth promised in the original budget. The fiscal deficit was projected to be 3.4% of GDP in FY19, an upward revision from the 3.3% original projection. It is projected to remain at 3.4% in FY2020. INR 750bn ($10.6bn) support package for farmers comprising of assured income of INR 6,000 per year for 120m of farmers with land holding under two hectares. 2% interest subvention to those pursuing animal husbandry and fisheries. INR 190bn for rural roads program in FY2020 - an unchanged amount from the allocation in FY2019. Increase in allocation to Rural Employment Guarantee program by INR 50bn to INR 600bn for FY2020. A pension plan for the organized sector. INR 3trillion for defence spending. Personal income up to INR 500,000 exempt from income tax. Increase in the standard deduction for income tax to INR 50,000 from INR 40,000. Increase in the limit on tax deduction at source (TDS) from INR 10,000 to INR 40,000. Easing of tax rules for property - income tax exemption on a second residential house and considerations for easing of goods and services tax (GST) burden for homebuyers. FY20 net borrowing set at INR 7.04t with a planned reduction in the debt-to-GDP ratio to 40% by FY2025 from estimated 49% for FY19. Strong nominal GDP growth of 12.3% in FY19 and 11.5% in FY20. The government is clearly ramping up spending to enhance its chances for re-election. 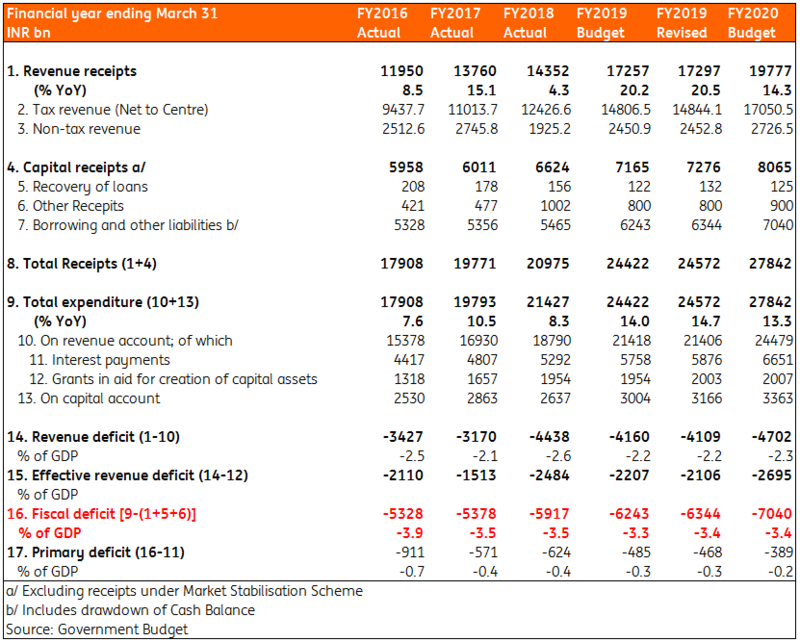 Although the revised fiscal deficit of 3.4% for FY19 is below the 3.5% consensus estimate (ING’s 3.6%), it’s hardly a recovery from the 3.5% of GDP deficit in FY18. And it is still a deficit overshoot for the second consecutive year. 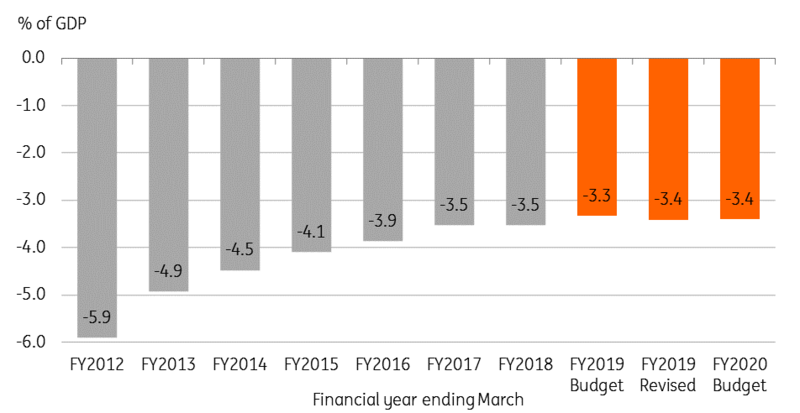 Moreover, the 3.4% deficit target for FY2020 shows no intent of fiscal consolidation, which casts further doubts on the government’s medium-term plan to cut the deficit to 3% by FY2021. The assumption of 20% revenue growth in the current fiscal year looks optimistic given the year-to-date (April-November 2018) growth of ‘only’ 3.4%. The expectations of sustained strong revenue growth, about 15%, in FY2020 also remain at risk as the political uncertainty and the global economic slowdown weighs on domestic businesses and India's GDP growth. On our forecast GDP growth is likely to dip below 7% in the next financial year. The real question is will these populist measures will help the incumbent government remain in power for a second term? The government’s view of the economy remaining on a solid growth path and turning into a $5tr economy in the next five years and $10tr in next eight years appears to be ambitious as a large number of young people struggle to find jobs. The latest reports of a 45-year high unemployment rate of 6.1% in the last year is a shot in the arm for the government that's basking in the glory of an economy being among the fastest-growing economies in the world. The INR 750bn farmer support package may look like a big initiative on the part of the government, though the INR 6,000 ($85) per year assured income to a farmer isn’t going to be much of a boost to his living standard, and that could undermine the drive to double farmers’ income by 2022. The INR 7.04tr borrowing plan for FY2020 beats the consensus view of INR 6.4tr. A sharp, 31% rise over revised INR 5.35tr borrowing in the current fiscal year will not only pressure the borrowing costs higher but also be a significant crowding out of private investment. Moreover, it will sustain government debt-to-GDP ratio at the current high level, without much assurance about the plan to bring it down to 40% by 2025. Loose fiscal policy may support growth, though not without its inflationary side-effects. This means the central bank (RBI) will have to tread a cautious path on the monetary policy. We aren’t forecasting the RBI to move rates this year, but, with the ongoing pressure from the government to pursue growth-friendly policy, we wouldn’t be taken aback if the central bank cuts rates at as early as next week. Finally, the question is whether these populist measures will help the incumbent government to remain in power for a second term? This hinges on whether the measures will actually be implemented in time for elections, or whether they just remain announcements. A voter will want to see real benefits before he votes.